Arrr, can ye win this battle of wits using basic computer programming? Potato Pirates will turn anyone into a coding genius. Using very basic computer programming concepts, players plan their attacks on other players' ships in this fun, challenging and unpredictable card game. Some educational games can be a drag but Potato Pirates will leave you begging to play again. 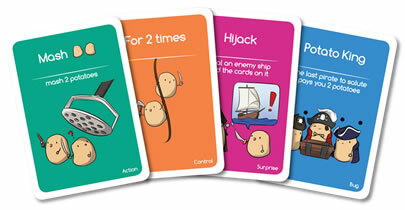 Best for three to six players ages six and up, Potato Pirates has some unique cards and a bag full of brown puff balls (that's your crew). Don't be intimidated by the sound of a programming game, learning how to play is fairly easy and after one game you'll have it all understood. Take your game night to a whole new level. 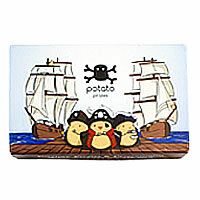 Give Potato Pirates a try today! Review Completed (2017-10-07) Some games have an alternate educational meaning or purpose. A fun game mixed with an opportunity to learn something new is a win-win right? Potato Pirates takes this concept to a whole new level by tackling the challenge of teaching people basic computer programming code. They even claim ages six and older can play. While there are some really bright kids out there, there are also some slightly slower adults so it completely depends on who is playing and their capacity (and willingness) to play the game. We say that because if you've never coded or know nothing about code, this game has a slight but quick learning curve. The learning curve mentioned above is that Potato Pirates really makes players think logically with conditional circumstances. Players will use cards that say you can only take a certain number of pirates if, for example, they have more than 4 pirates. Players build up their attacks by using these cards and you can get really carried away making complex situations. You can also keep things simple. Not only is there strategy in the game, your brain will be running in high gear as you try to set and understand each attack. Having said that, if you're willing to learn or have had some programming experience, this is a wild game. Now you get to turn coding into a fun and challenging game. We'll go ahead and call this a nerdy game – but we mean that in the best and politest way possible and you should be proud that you can master this game! Potato Pirates has some extra fun aspects to it. Players use brown puff balls (potatoes pirates) to fill their ships and are kind of treated like a form of currency. If ships are destroyed or stolen, players can get back in the game by purchasing another ship. Luck of the draw will also help in collecting the coveted Potato King cards although players can take those too. There are so many twists and turns in this game you'll never really know who is going to win until they already have. We had a blast playing this game. We had only one person that was familiar with coding and all the others learned quite a bit. We all wanted to keep playing. Once certain concepts are grasped, this game can be pleasantly addicting as a true battle of wits (and potato pirates we suppose). Collect all seven potato king cards and you'll be the winner. 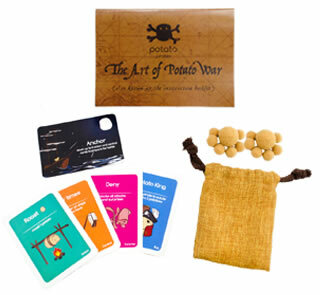 You'll get 103 cards, 14 large potatoes, 70 small potatoes and the official Potato Pirates game rules and instructions. Please keep in mind that the official Potato Pirates dice-card rules and instructions could be different depending on the game version you have. The rules below are some of the exact directions on how to play Potato Pirates. Share with us your comments, funny stories, tips, advice, strategies, creative ways to play, questions about how to play, problems with the rules or anything you want about Potato Pirates. All submissions will be reviewed within 24 hours. Click here to add your Potato Pirates comments.